Published: July 1, 2014 at 10:16 a.m. 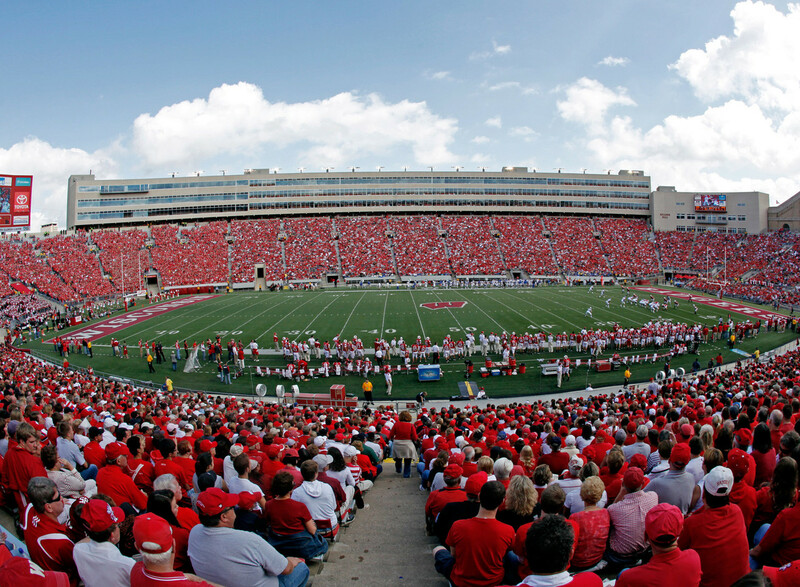 Updated: July 1, 2014 at 12:20 p.m.
What does it take to have a great stadium? Certainly some history, mixed in with a little bit of mystique, combined with a great view and plenty of fans yelling at the top of their lungs. There are tons of quality places to watch a game at the college level, but here are 14 of the best from all over the country. Hard to go wrong when you have a great college town and a terrific place to watch college football on a Saturday afternoon. Between the nearby lakes and the fantastic tailgating scene, just about everybody goes home happy -- especially if the Badgers win. If you're looking for some fun, look no further than jumping around at this stadium with thousands of your closest friends. Formerly Bronco Stadium, the recently renamed home to Boise State is among the most recognizable places in the sport thanks to the famous blue turf. It's eye-catching in person and more so on TV, but it's worked out well for the Broncos as they have been one of the most successful teams at home the past decade. An intimate setting that gets loud also has some great views. An imposing stadium that dominates Lincoln, few places are more intimidating for visiting teams to enter. The small touches and exterior are carefully constructed in a classy way and the sellout streak dating back to 1962 certainly adds to the venue's lore. The sight lines are great and the massive press box is filled with very nice luxury suites. The Black Knights haven't had many good teams lately, but at least they get to play in one of college football's most picturesque venues. One of the oldest stadiums in the country (dating back to 1924), recent updates have turned the site into a cozy place on a Saturday afternoon with a gorgeous backdrop and terrific atmosphere with all the cadets. It would be hard to leave the biggest stadium in the country off this list, and the sheer size of the Big House is a sight to behold on game day and well worth the trip to Ann Arbor. The amenities are also top notch compared to some of its college brethren, from the big screen to the club seats to a massive press box. There are few places quite like Athens on a college football Saturday when the Bulldogs are at home. Watching a game between the hedges is a sight to behold from the sundresses to the shrubbery to the mausoleum with all of the former mascots. There are bigger and louder venues around the country but if you soak it all in at Sanford, you won't leave disappointed. If you mention the Horseshoe to any football fan, they're likely to instantly recognize that you're talking about the Buckeyes' famous home. It's one of the loudest in the country when the sea of red gets into the game and it often seems even bigger than it actually is. The exterior is nicely done and a hallmark of the venue that is as good as any to take in a game. Death Valley is a loud, intimidating venue with one of the best entrances in any sport as the crowd goes wild when the Tigers run down the hill and past Howard's Rock. After that, the sea of orange fans as far as the eye can see takes over and gives Clemson a huge home-field advantage as another loud stadium in the South. The Irish are slowly changing the perception of their stadium being the most old-school venue in the sport, but no one can deny it's an unbelievably cool place to watch a game. While the long grass is gone and "Crazy Train" and Dropkick Murphys get played way too much, there are still plenty of must-see traditions to take in. With Touchdown Jesus overlooking the House that Rockne Built, this is one fantastic place to watch a game. Other stadiums are bigger, others might even be nicer, but it is hard to find one that is louder than Autzen on game day, especially out West. Despite holding just 55,000 or so, the fans show up early and they come loud as their Ducks get an extra boost on defense. With all the amenities you can ask for from field level to the press box, a trip to Eugene for a game here should be on the bucket list. We'll put an asterisk here since the Aggies are putting the stadium through a massive $400 million renovation that could turn this into the best college stadium in the country. Even if you don't look at what the field will be like a year from now, this is still one of the best places to watch football thanks to the fans, affectionately known as the 12th Man. There are some traditions outsiders might deem strange, but it certainly adds to the uniqueness that is Aggieland and it is certainly a sight to behold -- and feel -- when nearly 100,000 people start swaying back and forth. The West Coast has a ton of great settings for college stadiums, but it's hard to beat this jewel on the shores of Montlake. Thanks to a $250 million renovation this is one of the nicest venues in the sport and the administrators somehow managed to make it even louder with fans closer to the action than ever before. One can sailgate before the Huskies take the field while soaking up the terrific views of the lake and nearby Cascade Mountains. Thankfully, they also fixed the overhanging press box that tended to bounce up and down quite a bit when fans started to get into the game. One of a number of stadiums with the nickname Death Valley, most opponents would agree that a trip to Baton Rouge often lives up to that billing as of late. The tailgating scene is ridiculous, it has a unique exterior design, the opposing fans are stuffed a mile away from the action and it can get louder than anywhere when the Tigers need the noise. Plus, if you ask Les Miles, the grass is better here than anywhere in college football. First, let's make a distinction between the venue used for UCLA "home" games and the one that hosts the bowl game because there is certainly a difference. The one that is the setting for The Granddaddy of Them All is, without a doubt, the best place to watch a college football game in the country. No matter who is playing in the bowl game, there's nothing like watching the sun set on the San Gabriel Mountains while seeing great football being played on the field on New Year's Day. A number of recent renovations have added to the comfort level of the best venue in the sport, too.